King Harald V and Queen Sonja of Norway attended a research symposium on social welfare at the Chinese Academy of Social Sciences (CASS) on Oct. 15 during their state visit to China at the invitation of Chinese President Xi Jinping. The king also delivered a speech at the symposium. Xie Fuzhan, CASS president and secretary of the leading Party members’ group of CASS, expressed a warm welcome to King Harald and Queen Sonja. King Harald has visited China many times and made important contributions to promoting the development of China-Norway relations and the friendship between the people of the two countries, Xie said. The friendly exchanges between the Chinese and Norwegian people have a long history, having yielded fruitful results in cooperation on economy, trade, investment and production capacity. Science, technology, culture and local exchanges have become increasingly close, Xie continued. 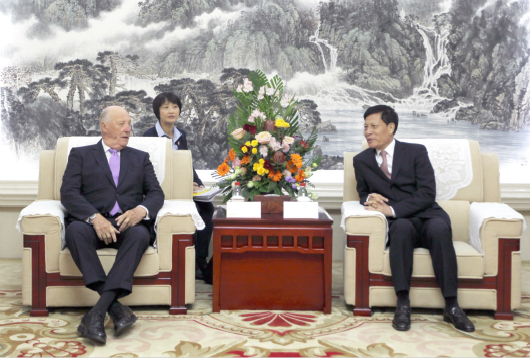 Harald V talked about his four visits to China and discussed the social welfare of Norway. He said that through its exchange with China, Norway has witnessed the accomplishments of China’s reform and development, especially its tremendous achievements in sustainable development and poverty alleviation. China is Norway’s largest trading partner in Asia, Xie said, adding that both sides firmly support free trade and a rules-based multilateral trading system. Norway is a typical representative of the modern welfare state, with its Human Development Index often ranking first in the world. Norway has accumulated rich experience in the construction of a social security system and the promotion of balanced economic and social development, Xie said. Over the past 40 years of reform and opening up, Xie continued, China has always taken the enhancement of the people’s wellbeing as the starting point and foothold. People’s living standards have improved remarkably, and more than 700 million people have been lifted out of absolute poverty. China is moving towards building a moderately prosperous society in all respects by 2020. Jointly holding the symposium under the theme of “social welfare in national and international dimensions” is of great significance, conducive to enhancing mutual understanding and strengthening cooperation between China and Norway in the field of social development. CASS, China’s highest academic institution in the humanities and social sciences and a comprehensive high-end think tank, provides theoretical and intellectual support for national development. His Majesty’s visit will surely promote exchange in the humanities, social sciences and think tanks between China and Norway, Xie said, adding that he looks forward to the future cooperation between experts and scholars of the two countries to contribute more wisdom and strength to bilateral friendly cooperation. Harald V pointed out that both Norway and China should care about the sustainability of the social welfare system and the challenges of climate change, striving for better welfare for the whole society and for creating a better future for coming generations. This is a common goal of the two countries, and it is also the reason why the top experts from both countries gathered at CASS to exchange ideas. The king expressed his hope that the two sides can learn from each other through this exchange and that these experts and scholars in the social sciences can jointly promote academic exchange between the two countries. Ine Marie Eriksen S?reide, the Norwegian minister of foreign affairs, said that Norway-China relations have a solid foundation and a long history. In terms of welfare and social security, the two countries can learn from and cooperate with each other. In the past few decades, China has made remarkable achievements in economic growth and poverty reduction. There are many reasons for this, and the most important one is China’s trade and cooperation with the rest of the world. Through reform and opening up, China has achieved unprecedented development. Today, S?reide concluded, we need to build a world that encourages people’s potential, creativity and hope through cooperation, trade and information exchange.